I didn’t get done all the things I wanted to get done today cuz I was too busy doing all the other things on my list. You know how it is. Right after some errands and my very late breakfast, I kinda stood frozen for a moment of ‘which way do I go?’ Anxiety in the dullest sense. I took some materials outside to write, and that proved too hot. So instead I came inside and finally made headway on moving furniture; because lifting heavy objects (dragging a chaise lounge) none of this is obviously heat inducing. With furniture in different rooms, I had to rearrange art. I had to move one of my heavy mirrors I’d actually paid a professional to hang originally. All of this brought out the ruler, the pencil, and the level. I can’t just do something, I have to go all the way. This is probably why I have those occasional pangs of anxiety. What the hell am I going to get myself into? The mirror was hung perfectly on the first try. All of the new arrangement is because I am getting a proper desk. Once upon a time, I had a white desk -at the height of the minimalism decor craziness, 2 condos ago. The woman who bought the place had two daughters and I left it to them for free in their new-to-them bedroom with 2 walk-in closets. The desk fit perfectly in one of the closets and they loved it. I also left crayons and coloring books in the drawers. 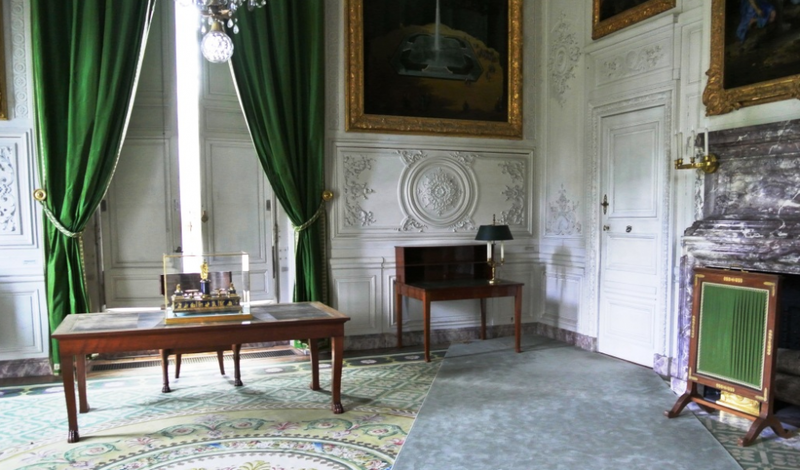 The desk I am currently waiting on reminds me of one of Napoleon Bonaparte’s. This desk is in his study on within the military headquarters which sit outside of the actual castle but within a few blocks walking distance. The green was unforgettable to me too. [I’ve been three times to Versailles; it wouldn’t be a useless three more times] Mine won’t be ready for business till I strip it, sand it, and re-stain it. I have my supplies and skills, I’m waiting. Just another delightful, meditative project. Truthfully, the wood detail on mine is so much more elaborate and exquisite, from the triangular wooden wings connecting the legs to the table, and the three drawer handles. The table is just as long though. Overjoyed. Another example of this proclivity in my personality: I got off work an hour early Friday for this delicious and greatly appreciated long weekend. I efficiently ran four errands before congested traffic went about its ritual. Still no gas in Dallas after the mass hysteria and siphoning off of it anywhere within a 5 mile radius of me, but this is beside the point. People, ugh! So I get home and go through my usual moves of just getting home. About to wind back downstairs to the kitchen when I see my little floor fan in my bedroom is terribly dusty. It’s white but displaying a shade of grey. Eww, this was blowing in my direction! I also have a ceiling fan whirling above, but you gotta have the summer extras. I took it apart and washed its parts in the bathtub, then cleaned the bathtub, then got on a ladder and cleaned the other fan blades. After this, yes I had to vacuum what may have descended onto the floor. Goodness gracious, this is me! This is why I must sit down to read. This is why I relish the pull, the settling down, resting the body and engaging in a calm linear way. And tomorrow, finally, I will launch a distinguishable Page link on this site specifically for books. A damn long time coming if there ever was one.